I never thought much about salvias before I saw them in big drifts in the Lurie Garden in Chicago. They seemed a bit, oh, I don't know, ordinary? The dark bluish-purple spikes just seemed to fade into the shade in my garden. 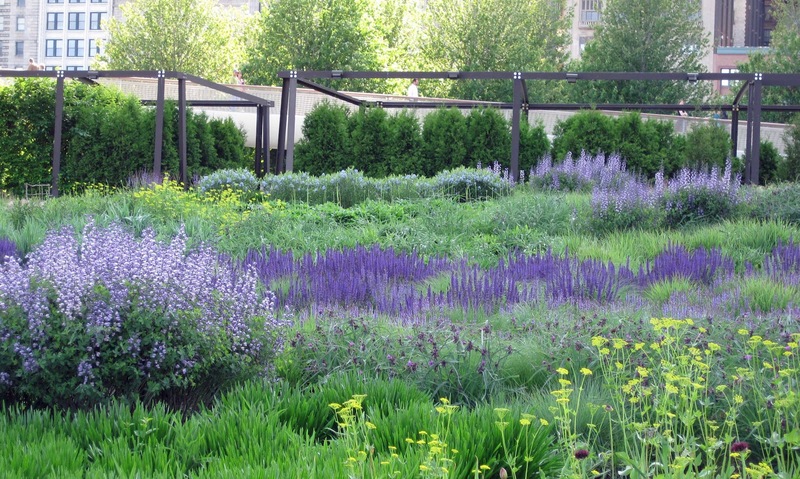 But when I saw the big drifts of them in the Lurie Garden, mixed with the lighter shades of purple Baptisia, in a sea of green punctuated with occasional yellow blooms, I changed my mind. Now I can't get enough salvias for my garden. I have similar stories from other times when I've left my garden to go see other gardens, whether those gardens are just around the corner or on the other side of the country. My head spins with new ideas for my own garden. One might think that leaving my garden to go see other gardens might make me less satisfied with my own garden, but the truth is it has made me happier with my own garden because of what the newly discovered plants and ideas have added to it. That's how I came to discover that the fifteenth secret to achieving happiness in your garden is never going to be found in your own garden. It's "out there", in another garden, because the secret really is "leave your garden". Yes, leave your garden. Don't leave it forever, but leave it for brief periods of time to discover ideas and plants that you can bring back to it, making it better in the long run. And better in the long run means you'll be happier with it. Leave your garden, the 15th secret to achieving happiness in your garden. Go now. Put on your traveling shoes, plop a good hat on your head, grab your walking stick and leave your garden to achieve happiness in it. Salvias are great and agastaches too - both are deer proof which is vital for me! I love this one. Other local gardens are so inspiring, but even gardens in different climates can spark the imagination and ideas can be borrowed and translated. There really is no substitute for seeing things in person and getting the direct experience. Salvia has been on my mind, too. I was inspired by the Smith College Gardens and Arboreum. I love all the local garden tours, too, that let me see what all the creative gardeners in my area have come up with. They usually give good cultural info too. A great secret. Other gardens can be so inspiring! I love salvias - they stand up to the heat so well and are such tough, determined plants. I love salvias and anything else that has a blue bloom! Those salvias are beautiful. Maybe I will visit the Lurie garden next time I visit my daughter. You are so right about the benefits of visiting other gardens. I love doing this and come back home full of enthusiasm and new ideas. Very well said. Thanks for the reminder and the inspiration! Leaving your garden to hang out with other gardeners is even more important! Can't wait to do that in 10 days!